The Beginning is an inspiring story written for Zen Moments by Heather about how she began working with driftwood in her sculpture. 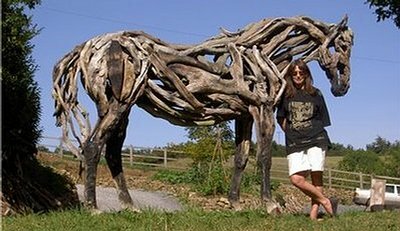 An astonishing transformation took place as the horse sculpture came alive with great force. In any given moment the answer to your problem is staring you in the face – if only you can see it. To bring something into existence from thin air is pure oxygen. When the creative flow is running, my energy is boundless, everything around me seems to vibrate with potential. When the creative flow is running… all is magical. When the muse is on my shoulder I have to follow her fast. To deny the muse is to deny life! To wake in the morning with an idea burning bright inside is the best of all possible worlds.